Infarction of the greater omentum is a rare cause of acute abdomen with only few cases reported in the literature. Given its low incidence and lack of awareness among clinicians, an accurate preoperative diagnosis is unusual and patients may be explored for peritonitis due to other causes. Omental gangrene presenting as a late complication following corrosive ingestion has not been reported in the literature. To our knowledge we report here the first case of omental gangrene occurring nearly three months after corrosive ingestion, presenting as an acute abdomen and requiring surgery. A 40-year old female had ingested corrosive acid 3 months ago, following which she developed abdominal pain associated with vomiting and was managed conservatively. She had no respiratory distress, hemoptysis or hematemesis. She developed dysphagia to solids and semisolids 1 month later. 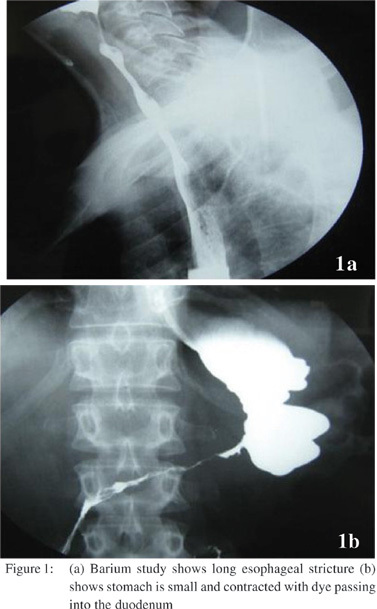 Barium study showed a long esophageal stricture (Figure 1a) with a small capacity contracted stomach, and passage of dyeinto the duodenum (Figure 1b). She was planned for an upper gastrointestinal endoscopy and possible dilatation of esophageal stricture. Esophagoscopy revealed a stricture just below the upper esophageal sphincter for which dilatation was attempted. A day after dilatation, patient came with acute onset severe pain abdomen.On examination her pulse rate was 120/ min and BP 100/60 mmHg. Abdominal examination showed signs of peritonitis. She was resuscitated with intravenous fluids and intravenous antibiotics were started. Blood gases showed metabolic acidosis. With a pre-operative suspicion of lower esophageal perforation, the patient underwent exploratory laparotomy. Per operative findings revealed dark hemorrhagic foul smelling fluid with gangrenous omentum (Figures 2a & 2b) and no evidence of gastric or esophageal perforation. Stomach was small and contracted. Surgical procedure included omentectomy, feeding jejunostomy, lavage and drainage. She was kept on elective ventilation and was extubated after her acidosis was corrected. Postoperatively she developed chest infection which was treated with antibiotics. She wasdischarged after 2 weeks. 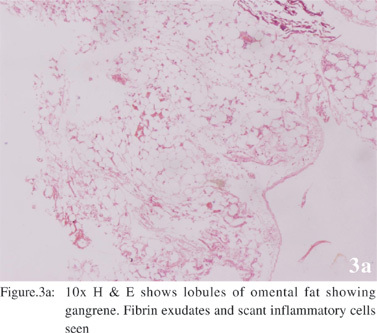 Histopathology showed lobule of omental fat showing gangrene with fibrin exudates and few inflammatory cells (Figures 3a & 3b). At 3-months follow up she is taking feed through jejunostomy and is being worked up for definitive surgery. Primary omental torsion was first reported by Eitel in 1899 in which a bulky and mobile greater omentum particularly on the right side twists around the distal right epiploic vessels with subsequent venous occlusion, edema and arterial thrombosis leading to gangrene. Johnson in 1932 first described, primary omental infarction without torsion. The reported incidence is 0.1% of patients undergoing laparotomy for appendicitis. The incidence has been rising attributed to increased awareness of the entity, technical advancements in imaging and utilization of CT scan for evaluation of abdominal pain. The exact etiology is not known. Predisposing factors reported in the literature include variations in arterial supply to the right side of the greater omentum, excess omental fat associated with obesity (explaining its greater incidence in adults), hypercoagulability, trauma, straining, vascular congestion secondary to overeating, overexertion, and sudden positional change. Omental infarction in adults is rarely described following intra-abdominal surgery, after marathon running, with right-sided heart failure, or as a complication of vasculitis. To our knowledge this is the first case in which corrosive ingestion has been the pathophysiological mechanism for the etiology of late omental infarction. The reason for late development of omental gangrene following corrosive intake is not known, but could possibly be related to the development of thrombosis of the omental vessels resulting from inflamed contracted stomach following corrosive ingestion. The right side of the omentum is affected in the majority of patients leading to right sided abdominal pain. The right-sided predilection is usually attributed to anomalous right omental vascular development. [5,6] It was predominantly left sided in our case, probably related to the etiology of gangrene. Other symptoms include low grade fever and occasional vomiting. Leukocyte count may be mildly elevated. Characteristic features[7,8] of omental infarction on imaging may help in making a preoperative diagnosis in suspicious cases. The omental infarct on CT scan appears as an ovoid area of high attenuated fat containing hyperattenuated streaks just beneath the parietal peritoneum with thickening of the overlying anterior abdominal wall. Ultrasound scan shows the omental infarct typically appearing as a hyperechoic, noncompressible, ovoid intra-abdominal mass adherent to the anterior abdominal wall with localized point tenderness. Omental infarction usually follows a benign course that allows conservative management. Spontaneous and complete resolution of symptoms typically occurs within 2 weeks. However non-operative treatment has a risk of leaving the necrotic tissue inside, resulting in prolonged convalescence due to gangrene or abscess formation. Omental abscess and bowel obstruction are the delayed complications of omental infarction. Surgery is indicated in patients who have worsening of symptoms on conservative management, in whom omental gangrene result in sepsis and when there is diagnostic dilemma. Surgery usually results in early resolution of symptoms with little morbidity. 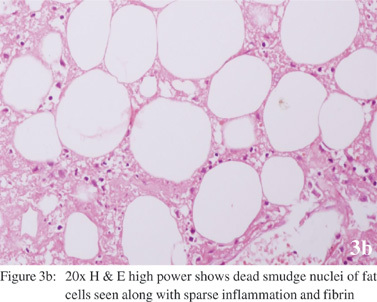 Histology shows hemorrhagic infarction associated with fat necrosis, followed by cellular infiltration, fibrosis and scar formation. Johnson AH. The great omentum and omental thrombosis. Northwest Med. 1932;31:285–90. Lardies JM, Abente FC, Napolitano A, Sarotto L, Ferraina P. Primary segmental infarction of the greater omentum: a rare cause of RLQ syndrome; laparoscopic resection. Surg Laparosc Endosc Percutan Tech. 2001;11:60–2. Rich RH, Filler RM. Segmental infarction of the greater omentum: a case of the acute abdomen in childhood. Can J Surg. 1983;26:241–3. Wiesner W, Kaplan V, Bongartz G. Omental infarction associated with right-sided heart failure. Eur Radiol. 2000;10:1130–2. Ho CL, Devriendt H. Idiopathic segmental infarction of right sided greater omentum: Case report and review of the literature. Acta Chir Belg. 2004;104:459–61. Mainzer RA, Simoes A. Primary idiopathic torsion of the omentum: Review of the literature and report of six cases. Arch Surg. 1964;88:974–83. Puylaert JB. Right sided segmental infarction of the omentum: clinical, US, and CT findings. Radiology. 1992;185:169–72. Karak PK, Millmond SH, Neumann D, Yamase HT, Ramsby G. Omental infarction: report of three cases and review of the literature. Abdom Imaging. 1998;23:96–8.